Rosa Achmetowna is the outrageously nasty and wily narrator of this rollicking family saga. When she discovers that her seventeen-year-old daughter, “stupid Sulfia,” is pregnant by an unknown man she does everything to thwart the pregnancy, employing a variety of folkloric home remedies. But despite her best efforts the baby, Aminat, is born nine months later at Soviet Birthing Center Number 134. Much to Rosa’s surprise and delight, dark eyed Aminat is a Tartar through and through and instantly becomes the apple of her grandmother’s eye. While her good for nothing husband Kalganow spends his days feeding pigeons and contemplating death at the city park, Rosa wages an epic struggle to wrestle Aminat away from Sulfia, whom she considers a woefully inept mother. When Aminat, now a wild and willful teenager, catches the eye of a sleazy German cookbook writer researching Tartar cuisine, Rosa is quick to broker a deal that will guarantee all three women a passage out of the Soviet Union. But as soon as they are settled in the West, the uproariously dysfunctional ties that bind mother, daughter and grandmother begin to fray. 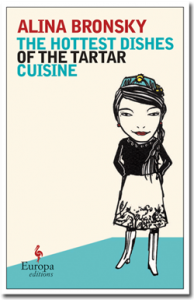 Told with sly humor and an anthropologist’s eye for detail, The Hottest Dishes of the Tartar Cuisine is the story of three unforgettable women whose destinies are tangled up in a family dynamic that is at turns hilarious and tragic. In her new novel, Russian-born Alina Bronsky gives readers a moving portrait of the devious limits of the will to survive. My view: I absolutely loved this book, and ordered 'BROKEN GLASS PARK' by the same author. I am going to skip writing a review as I am terribly busy, however I want to let everyone know, this is a must read! Oh, this isn't a cook book. I've put this on my list of books to search for. Sounds marvelous as am reading another book about mother and daughter relationship right now! I just bought "BROKEN GLASS PARK" by the same author, I love her writing style and sense of humor even so the subjects she addresses are not always for laughs.